In GTA 5, there are missions for the Taxi Lot property, and there are also the classic Taxi missions that have dynamically generated passengers, pickup points and destinations. The first section covers the classic missions. The second section goes through all 9 taxi missions for Downtown Cab Co. The goal in taxi missions is to quickly get passengers to their destination without driving too recklessly, and you will get large tips. Fares will appear as blue dots on the radar, and the destinations will appear as yellow markers. 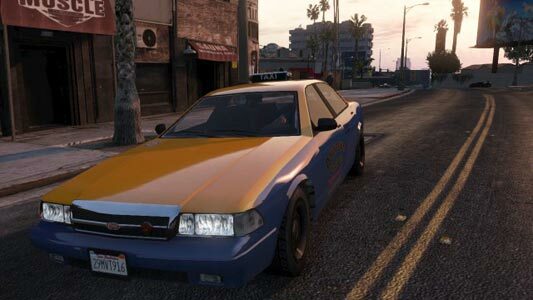 Although you can do taxi missions with any character, it is recommended to do them as Franklin for his driving specialty which allows you to slip through traffic and take corners at top speed. Once you get to a destination, press the L button to get a new fare. After you purchase the LS Taxi Cab Co. (Check the GTA 5 properties section to find where it is) Franklin should receive a phone call from the manager asking for help getting a Private Fare to their destination. Note that you don't need a taxi to complete this missions. Any vehicle with two seats will do. Note: There are a total of 9 private fares for Downtown Cab Co. This mission is no ordinary taxi mission, first pick up your fare at the Mount Zonah Medical Center. The target destination is marked by a flashing "P" and will change to a blue blip as you get closer. Your fare has a fetish for reckless driving, and asks you to get him to the Vinewood sign, the crazier your driving, the more you will get paid. To keep the passenger entertained, go really fast, drift through corners, drive on the wrong side of the street, do stunt jumps, near misses and even doughnuts. Speed is the main goal here though, so try to keep going fast. Once you make it to your destination, you should get a daredevil bonus of $200, the fare fee ($150 - $190) and the tip. (Somewhere around $100). Follow the blinking "P" to the passenger outside of the Up-n-Atom Burger in Vinewood. This mission requires you to drive carefully since the guy is on his way to an AA meeting and is "feeling woozy". Avoid crashing into other cars, or any kind of rough driving, or he will throw up and you will lose your tip. Drive slow and take your time. A good tip is to put on a radio station with some soothing music to calm him down. Once you arrive at the Rob's Liquor Store destination, you will receive $129 for the trip, and an extra $100 if you prevented him from puking. As well as a small tip. This mission takes place in Sandy Shores. First pick up the passenger outside the 24/7 Supermarket. This mission is timed, so as soon as he enters the vehicle, a timer will pop up in the bottom-right corner of the screen and will count down from 3 minutes and 30 seconds. The passenger needs to get to a poker game in Vinewood Hills as soon as possible. For this mission, it is recommended not to follow the displayed GPS route, but instead cut left across the road and through the desert. Franklin's driving ability will also help with this mission because of some really sharp turns. If you're fast, it is possible to complete this mission in less than 40 seconds, and your tip will be $122. You can also get a Ludicrous Speed Bonus of $200 and $300 for the fare. Note: Even though your fare will give you a weapon, it is recommended to bring along an SMG for this mission. Your fare will be waiting for you on Elgin Avenue in Pillbox Hill standing outside the Ammu-Nation. The passenger needs to be taken to the shipyard off Singal Street in the Port. There is a twist in this mission as soon as the fare begins, the passenger will tell you that he is meeting some dangerous people and he will make it worth your while if you cover him. He gives you a gun and tells you to use it in the worst case scenario. Once your fare exits at the Port, he will ask where his Niece Kelly is and the gang will refuse to answer him, at this point, he will pull out his gun, and so will the Lost members. Once things get hairy, your fare will announce he is giving them 3 seconds to get away, at this point, get out of your vehicle and take out the three gang members closest to your fare. Once you're done, you will receive around $170 for the fare, and $70 in tips. You can also get a Terminator Bonus of $230. Pick up your fare from the parking lot in the observatory in Galileo Park. This passenger needs a ride to the best tailor in Los Santos. First pause your game and look for the three clothing stores on your map. The one you are looking for is Ponsonbys in Rockford Hills. Once you deliver her there, you will receive $500 for the "Best Store Bonus" and $194 as well as a 70$ tip. This fare is located across the passenger loading and unloading zone at Los Santos International Airport. He needs to get to the Little Gems Jewelry store in Downtown (Mission Row, Atlee Street). Once you arrive, stop int he yellow marker on the street in front of the alley beside the jewelry store. Once there is an explosion in the alley, the man will run to your vehicle from the back of the store, and you will get a two-star wanted level. Head west to avoid the cops and continue this way through the city, taking turns to lose the cops. Once you arrive at the airport, you will earn $1000 for a smooth getaway, and for not being spotted, $360 for the fare, and a $10,000 tip. Not bad! This fare located in the ULSA campus, near the cul-de-sac flagpole in Richman on Richman Street asks you to take them to Elgin Avenue underneath the Olympic Freeway. Once you arrive, you will get $100 for the fare, $250 in tips and a $100 Knocked a Sucka Out bonus. Note that you need a four seater vehicle for this mission. In this mission, your passengers will be three men at the Richman Hotel in Richman. There are three stops, and the first is Maze Bank. The second stop is Fleeca Bank off Harwick Avenue in Vinewood. Turn on a hip hop radio station to satisfy your passenger and pull into the marker in front of Fleeca Bank on Power Street. The final stock will be at the 24/7 Supermarket on Innocence Boulevard in Strawberry, South Los Santos. After you complete the final fare, you will receive $200 for being Punctual, (if you were fast enough), the fare is $275 and if you drove safely, a tip of $100. This fare starts near her mailbox on El Rancho Boulevard. She needs a ride to Central Los Santos Medical Center on Capital Boulevard. Once again, follow the GPS route and along the way, your passenger asks you to take her to visit her cheating fiance. Once you arrive, she will ask you to follow him, at which point you should do so, but keeping a good distance to avoid scaring him. Now you follow the blue blip to the fiance's pickup truck. Once a cinematic is triggered, she vows to kill them both (the cheating fiance and the woman in the home), drive to the yellow marker in the parking lot, the lady will jump out and shoot the cheaters, and then takes off running. You will receive a Private Eye Bonus of $100 if you didn't get too close to the fiance during the mission and $165 for the fare. There is also a tip of around $70 that depends on your following skills. Congratulations, all 9 taxi missions are now complete! If you have any questions, comments or GTA 5 taxi mission hints, tips or tricks, please post them in the comments below. Thanks for visiting and for your contributions.